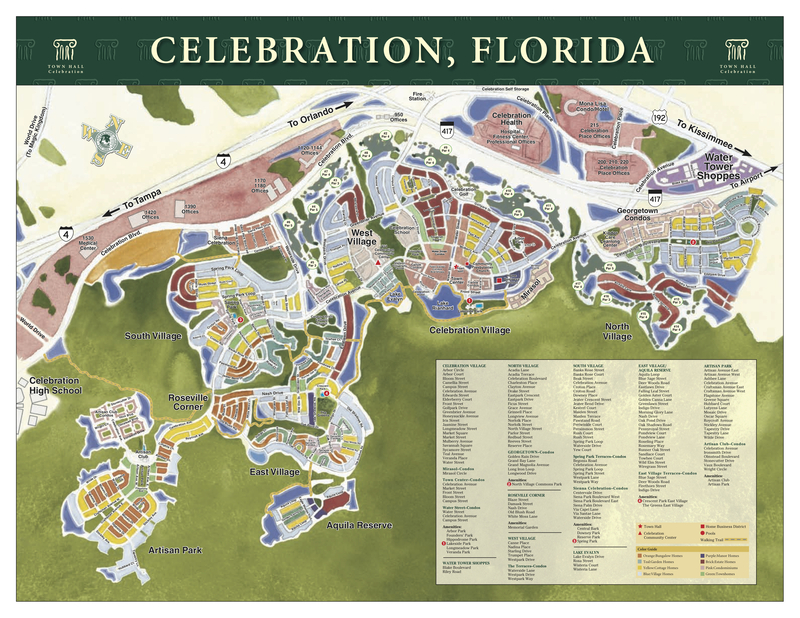 Right in the center of all the fun, Celebration is a new traditional neighborhood that was conceived and developed by the Walt Disney Company on land that used to be part of the Walt Disney World Complex. The developed residential area conveniently sits south of I-4 and the 417 Greenway and is roughly 20 miles southwest of downtown Orlando. The Disney theme parks can be easily accessed via World Drive. Celebration is close enough to the Disney parks that you can hear, and in some places see, the fireworks go off each night. Archival photos can be viewed in my Celebration Photo galleries: Celebration Photo Gallery #1. Celebration Photo Gallery #2. Current info and photos taken in and around town are posted to My Photo Blog on Blogger. The center of Celebration is the Town Center which is home to a densely populated area with many popular restaurants, shops, banks, offices, entertainment venues, church and community organizations, as well a mix of condos, townhomes and the Bohemian Hotel. Special events are frequent and can be found on the Front Porch community website. Celebration is also home to Florida Hospital-Celebration Health, Stetson University and a substantial amount of commercial office space on Celebration Blvd at Celebration Place. Celebration is divided into smaller sections called "villages." The first village was Celebration Village and includes the town center. West Village and Lake Evalyn were built next followed by North Village, South Village, and East Village. Artisan Park was developed last by the St. Joe company. 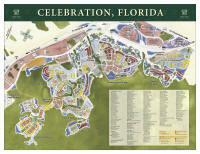 Click here to view the Celebration, FL map with village and lot types identified by color. Celebration Trails Map. Celebration Development Program ("Map H"). New retail/restaurant/grocery in works for corner of World Drive and Celebration Blvd... New Retail Center Plans. There are a total of 1935 single family homes, 53 duplex/triplexes, 223 townhomes and 1849 condominiums in Celebration. Floor plans are listed at the bottom of each detailed listing page if known. Celebration was recently featured in Forbes Magazine as one of "America's Prettiest Neighborhoods." Island Village on the western edge of the property beyond Celebration High School remains to be developed. Mattamy Homes is the selected developer/builder. Opening date is being reported as late 2019. Mattamy Homes is reporting "Island Village will feature pocket parks and gathering spaces, trails, a neighborhood K-5 school, retail conveniences, pools and recreation centers." For more information on the future deveelopement of Island Village: Mattamy Homes selected to develop and build Island Village area of Celebration, FL. Windsor at Celebration is now open! This new facility on Celebration Blvd. provides Independent living, Assisted living, and Memory Care for a monthly fee. For more info on this new senior living option, click here... Windsor at Celebration Senior Living Facility. Sign up for the Friday News Flash from Town Hall. The navigation bar to the left allows for easy searching of the different types of homes available by property type and price bracket. A few homes cannot be shown on the internet, so the list is not 100%. The active and available list is updated approximately every 15 minutes with data directly from MFRMLS. Contact me today to set up a custom search for homes in Celebration, FL. Join our customizable email alert list to see new properties that meet your criteria as soon as they hit the market. Single family homes, townhomes, and condos are available for sale in Celebration. Available home styles include Mediterranean, Victorian (Queen Ann, Key West, and Folk/Carpenter), Craftsman, Classical/Greek Revival, Colonial Revival, Low Country Coastal, Acadian Coastal, French, St. Augustine Coastal, and Pan Caribbean. Completely custom estate homes have also been built (such as an English Arts and Crafts home in Artisan Park). A condo-hotel project called Melia is in the commercial area near Celebration Place and 192. The style of Melia is modern. Ownership in Melia does not make owners members of the Celebration Residential Owners Association and it cannot be used as a primary residence. The residential areas of Celebration are subdivided into areas called "Villages." Celebration Village is frequently called Main Village and was developed first by the Walt Disney Company in 1994-1995. Celebration Village is where the mixed use Town Center commercial district is located with convenient access to the restaurants, bars, shops, banks, post office, and hotel. Main Village includes the Town Center Condominiums, WaterStreet Condominiums, Carlyle Condominiums (North and South), Estate Homes, Village Homes, Cottage Homes, Garden Homes and Townhomes on Academy Row and on Meetinghouse Green Townhomes. The Celebration K-8 School is in Main Village at the intersection of Campus Street and Celebration Avenue near Founders Park. Town Center frames Lake Rianhard with an expansive promenade along Front and Bloom Streets. Lakeside Park offers swimming, basketball, tennis, meeting space and a tot lot for resident use. A walking/jogging trail around Lake Rianhard offers residents a scenic connection by boardwalk to Lake Evalyn. After Main Village, Lake Evalyn and West Village were developed. North Village was built next, followed by South Village, Roseville Corner, East Village, Aquila Reserve (aka East Village Part 2), and Artisan Park (aka Area 5 or South Village 2). Artisan Park was sold by Disney to the St. Joe Company who developed the area in 2004-2006. David Weekley Homes is currently completing the area of Spring Lake near Celebration Blvd, which is technically part of South Village (Unit 4). The next Village of Celebration to be developed will be Island Village, which is in the early planning stages. Crescent Communities of Charlotte, North Carolina had expressed interest in developing this latest Celebration Village, but the current status of this phase of development is not clear. Island Village is expected to include approximately 1000 single family residences and 300 multifamily units in addition to community recreational amenties and public projects. MLS listing of Celebration, FL Real Estate by price bracket. There are currently 154 total Celebration properties listed on 34747.com. There are 28 active Celebration homes available in the price range of $250,000 and under. There are 68 active Celebration homes available in the price range of $250,000 to $500,000. There are 31 active Celebration homes available in the price range of $500,000 to $750,000. There are 14 active Celebration homes available in the price range of $750,000 to $1,000,000. There are 13 luxury Celebration homes available over the price of $1,000,000. There are 0 single family homes on the market in Celebration, Florida. There are 11 townhomes/villas/duplexes/triplexes for sale in Celebration, Florida. There are 0 condos for sale in Celebration, Florida. There are 4 condo-hotels for sale in Celebration, Fl. There are 21 properties with a pool for sale in Celebration, Fl. There are 18 properties for long-term rent in Celebration. 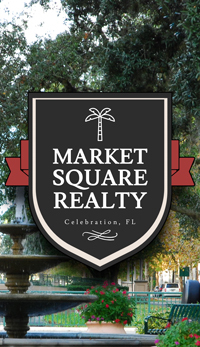 There are 0 REO/Bank Owned properties available for purchase in Celebration, Florida. There are 0 Short-Sales available in Celebration, Florida. 182 units of real estate sold in Celebration in the last 180 days.